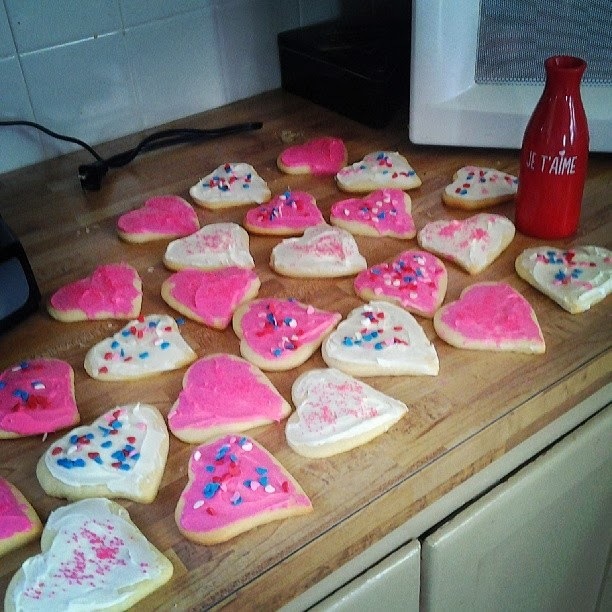 I realize that Valentine's Day has came and went, so this post is a little late, but this recipe can be used to make any type of roll out sugar cookies. St. Patty's Day Shamrocks anyone :)? Anyways, I've gathered quite the collection of cookie cutters within the past few years, So I make sugar cookies for pretty much every holiday, or just when I really need a cookie. This recipe is easy to put together and easy to use. In a large bowl, cream together butter and sugar until smooth. Beat in eggs and vanilla. Stir in the flour, baking powder, and salt. Cover, and chill dough for at least one hour (or overnight). Preheat oven to 400 degrees . Roll out dough on floured surface 1/4 to 1/2 inch thick. Cut into shapes with any cookie cutter. Place cookies 1 inch apart on ungreased cookie sheets.Bake 6 to 8 minutes in preheated oven. Cool completely.